Check out and follow our “Sustainability Techniques” page we just posted. The goal is to stimulate a discussion amongst our followers to help reduce and improve everyone’s practical sustainability. We will keep updating this page as time goes on and as we collect data, but for now, see what we are up to at the EcoRanch. We also provide links to water and energy saving calculators in the hopes that you can save some money. You can also see the amount of hours donated to the EcoRanch from WWOOFers and volunteers on our “Many Thanks” and how much this would equal if we paid each person $7.65/hr (Az minimum wage). 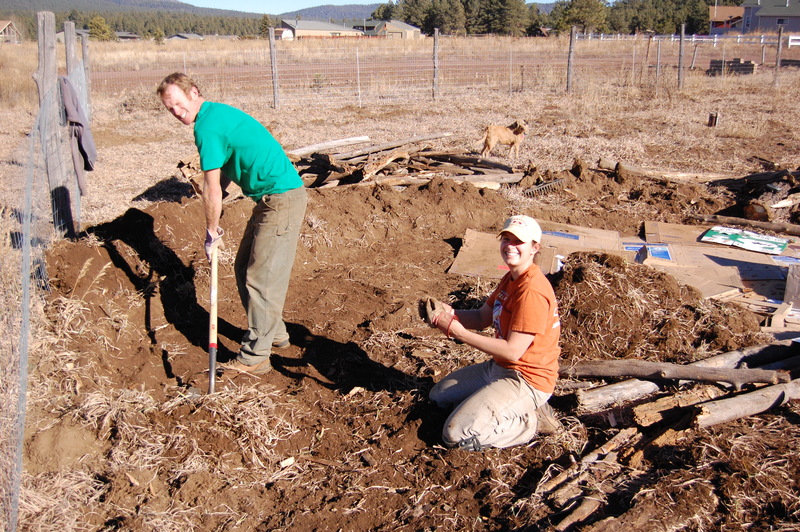 We also just finished installing our first hugelkultur bed, a permaculture method that Kara and Ben planned and designed for the EcoRanch. 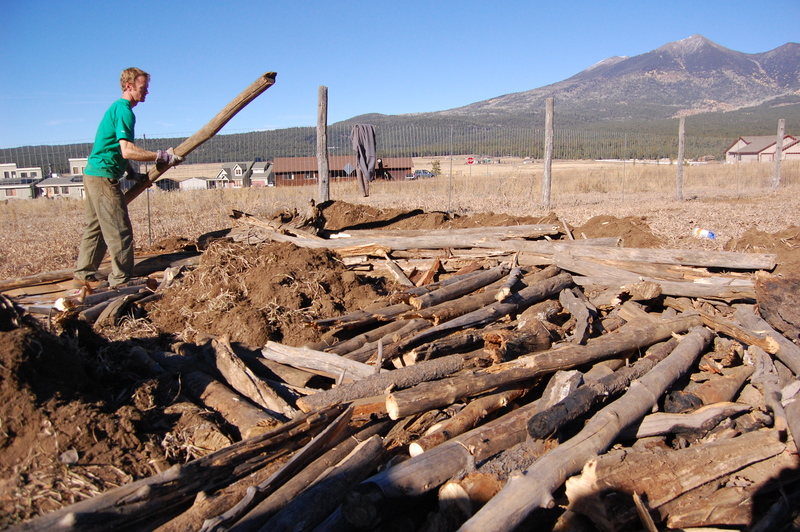 We dug down about a foot, put down a bunch of cardboard, then laid down old logs and sticks, covered them with sawdust, leaves, and woodchips. Next we spread a thick layer of soil and then another layer of woodchips. 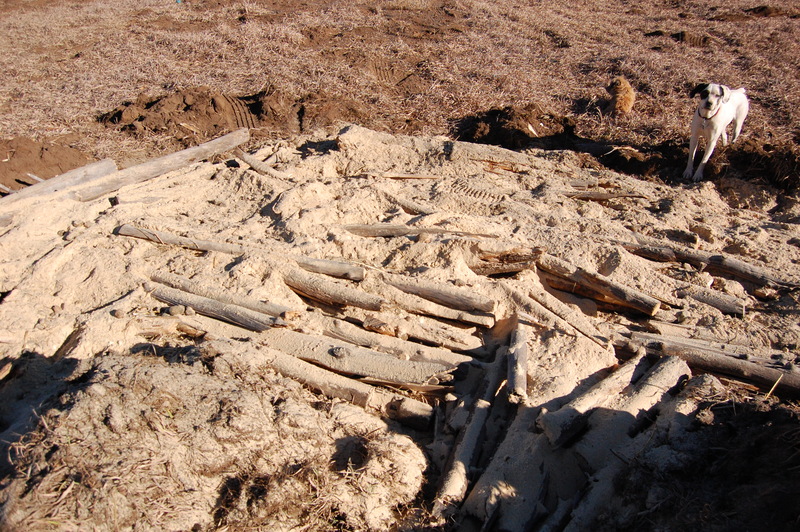 The idea is that the wood will absorb and slow the water flowing down the hill while breaking down, supplying nutrients to the soil and creating a small microclimate from the heat released from the decay of the wood and possibly extending the growing season. 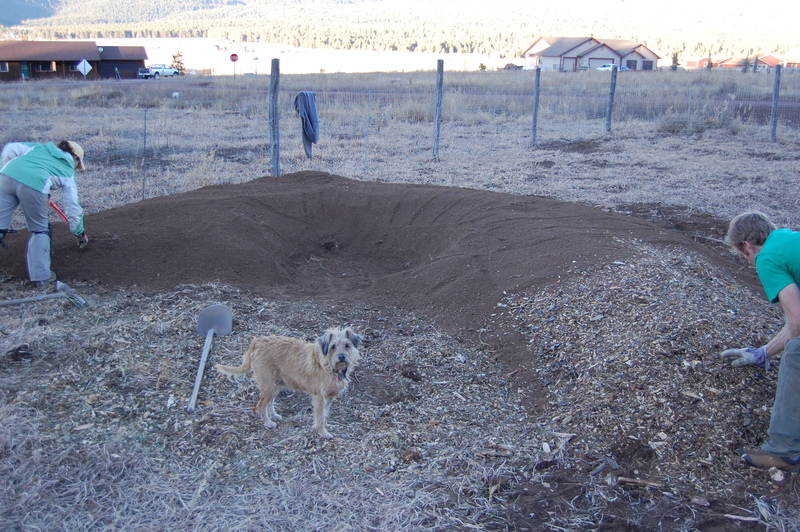 We plan on putting in one more before the snow comes and then two in the spring. Check out the photos below. This entry was posted in Uncategorized and tagged climate, environment, hugelkultur, hugelkulture, microclimate, nature, permaculture, science, wwoofers. Bookmark the permalink.